Fans of classic frontier survival stories, as well as readers of dystopian literature, will enjoy this futuristic story where water is worth more than gold. New York Times bestselling author Michael Grant says Not a Drop to Drink is a debut "not to be missed." With evocative, spare language and incredible drama, danger, and romance, Mindy McGinnis depicts one girl's journey in a frontierlike world not so different from our own. Teenage Lynn has been taught to defend her pond against every threat: drought, a snowless winter, coyotes, and most important, people looking for a drink. She makes sure anyone who comes near the pond leaves thirsty—or doesn't leave at all. Confident in her own abilities, Lynn has no use for the world beyond the nearby fields and forest. But when strangers appear, the mysterious footprints by the pond, nighttime threats, and gunshots make it all too clear Lynn has exactly what they want, and they won't stop until they get it. . . .
For more in this gritty world, join Lynn on an epic journey to find home in the companion novel, In a Handful of Dust. Let me start off by saying that this was my first EVER dystopian read. I was unsure what to expect as far as content & if I would even enjoy it. This being said, I have no other book in this genre to compare this to. But even if I did, I'm pretty sure that this book would still rank at the top of my list. Every character in this book has a personality that is solely their own. I quickly fell in love with Lynn & felt pure admiration for her mother. Each person that comes into the story serves only makes the plot stronger. I give major props to Mindy McGinnis for her the way each of her characters is written. 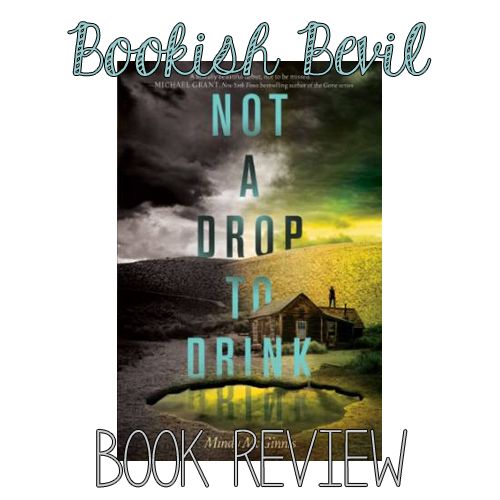 Just finished #notadroptodrink by @MindyMcGinnis & yeah~ The Feels are Real! Amazing book! Cant wait to share a review with you guys! That one tweet sums up how I felt throughout this entire book! I laughed, I cried, & I felt my heart race inside of my chest. And oh yeah! Can you say PLOT TWIST! There is no doubt in my mind- I would definitely recommend this book to my friends. Matter of fact- I'm totally recommending it to you now! Jessica has read 9 books toward her goal of 60 books.